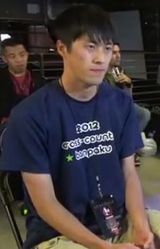 Gyaki is a Japanese Smash 64 player who is considered to be the best Link player in the world. He placed extremely well at Japan Smash Cup 2016, Kansai 2017, and Kanto 2017 with wins over Kurabba, Taimai, Yu-Kun, Wangera and kysk, despite using the low tier character Link. His first US tournament was Snosa III, where he placed 5th, losing to Dext3r and Mariguas, but defeating BarkSanchez, Heropie and Isai's Samus. This page was last edited on February 28, 2019, at 03:02.